Blog | Three Runs Plantation: Does your feeding program measure up? Heavy work is four to five hours per week, including 50 percent at the trot, 15 percent at the canter, and 15 percent galloping, jumping or performing other intense skills, with a mean heart rate of about 110 beats per minute. This category includes horses engaged in more intense showing, ranch or polo work as well as those in low to moderate race training and low- to mid-level eventing. These horses burn about 1.6 times their baseline calorie requirements. They may need to get up to 40 percent of their diet (by weight) from concentrates. Very heavy work can include one hour per week of high-speed work combined with six to 12 hours of slower work, with a mean heart rate of about 110 to 150 beats per minute. Most of the horses in this category are engaged in racing, endurance or high-level eventing. These horses burn about 1.9 times their baseline calorie requirements and may need to get up to 50 percent of their diet (by weight) from concentrates. Lift the bale above your knees and drop it onto a solid floor. Good hay will make a muffled sound and bounce. If it doesn’t, the hay may have gotten wet and developed mold. Cut the twine open. Good hay will “spring” open. Moldy or poorer hay holds its shape. Check the aroma. Good hay smells fresh and sweet. Any acrid or musty odors can indicate mold. Squeeze and twist a handful. Good hay is soft and flexible. Poorer hay feels harder, and the stems will stab your palm. 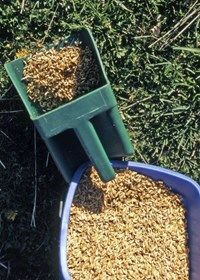 If you’re concerned about whether hay and pasture alone is meeting your horse’s needs, talk to your veterinarian about adding a vitamin/mineral supplement or a ration balancer product, which adds balanced nutrients, including amino acids, without a lot of extra calories.